Now a global symbol of moral courage among the people of China against an authoritarian and repressive regime, Liu was detained on December 8, 2008, two days before Charter 08’s scheduled date of release. He was tried and convicted on December 25, 2009. 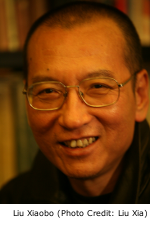 In October 2010, the Norwegian Nobel Committee announced its selection of Liu Xiaobo for the Peace Prize, citing his “long and non-violent struggle for fundamental human rights in China.” The Chinese authorities denounced the Prize and allowed neither Liu, his wife Liu Xia (刘霞), who has been under house arrest since the announcement of the Prize, nor any other members of Liu’s family to go to Oslo to accept the award on his behalf. The empty chair for Liu Xiaobo at his award ceremony has since become a potent symbol of the Chinese authorities’ intolerance of diverse debates on China’s future. This year has produced another Chinese Nobel laureate: Mo Yan (莫言), who won the Prize for Literature. Mo Yan’s selection for the Prize has prompted criticisms by many Chinese citizens because of his acceptance of China’s one-party rule and silence on many social and political issues. Exiled writer Liao Yiwu (廖亦武), one of the critics, sent an open letter to the Nobel Committee for Literature (available online at HRIC’s Citizens’ Square) detailing why Mo Yan was undeserving of the Prize and arguing that the Committee had made a grave mistake in honoring him. While Mo Yan accepted his award yesterday with a speech filled with stories, Liu Xiaobo is sitting silenced in a Chinese prison. HRIC urges the Chinese authorities to take this special opportunity to recognize China’s 2010 Nobel laureate by releasing Liu immediately and unconditionally. For someone who personally went through the 1989 Movement, in the long time since the June Fourth Massacre, and in the depths of my heart, the movement has not really failed. Even though it was a failure in fact, it was a failure of tragic grandeur. Compared with the temporary victory achieved with might by an authoritarian regime, the 1989 Movement holds the moral advantage over time, and I still firmly believe this when I criticize the movement. But it has already been 13 years since the Massacre. Facing the lost souls of June Fourth on this 13th anniversary, and seeing the difficulties the Tiananmen Mothers have in continuing their fight because of their isolation, this sense of tragic grandeur is being eaten away by my own unwillingness to admit a defeat so disastrous. The difference between “tragic grandeur” (悲壮) and “tragic” (悲惨) is just one word, but this difference marks the spiritual erosion of Chinese society that worsens with each passing day as well as my own self-criticism that grows heavier with each passing year. Why has the regime of the Communist Party of China, which owes a debt in blood but has not admitted wrong, not only not collapsed, but has been able to withstand world sanctions and moral condemnation? Why has it been able to survive a political crisis that lasted only briefly and continue to trample on human rights for more than a decade? While the CPC-led reform and opening up policy in China began earlier than the social transformation of the Soviet Union and Eastern Europe and while the example of the 1989 Movement inspired civil resistance in other countries, why is it that, 13 years later, the pace of China’s political transformation lags so far behind that in those states, so much so that it is behind even the notorious Burmese military junta? Why is it that, to-date, China’s civil opposition, having received both the attention and support of the international community, has not been able to form an organized civil pressure group? And why is it that the international community’s moral support and material assistance to China’s civil opposition forces have not achieved the results as in other countries going through transformation? And instead, the CPC regime has successfully bid for hosting the Olympics and entering the WTO? Having gone through a civil opposition movement that shocked the world, why is it that no one from China has received the Nobel Peace Prize, the most influential among the Nobel Prizes? What is the matter with the Chinese people? Every fellow countryman who personally experienced the 1989 Movement and still holds firm the concepts of freedom and democracy has no choice but to face this harsh truth: No one could have imagined that the 1989 Movement—which ended in its protest of the tragic and grand sacrifices in the Massacre, but which shaped a large-scale popular mobilization of mutual support across social strata, and which for the first time, made the world look upon the righteous strength of the Chinese people with admiration—could, after 13 years, have its influence worn down to nearly nothing, and the moral capital it had accumulated with blood nearly entirely squandered. The CPC has successfully distorted and purged the national memory through violent repression, ideological indoctrination, and bribery. Of those who personally experienced the Movement and the Massacre, some are overcome with regret that it has delayed their future in the world, while some are unwilling to bring up the memories of passion and bloodshed. For the younger generations who did not personally experience 1989, the majority of them do not even know exactly what had happened in China back then. In other words, the moral fervor and social consensus that launched the 1989 Movement no longer exist in China today. The pursuit of interests has overtaken the pursuit of righteousness as a priority. The great social stratification has taken the place of a consensus for political reform across all levels of society. The polarization between the elites who benefit and the ordinary people who lose has already reached a degree of sharp opposition with regard to interests. This polarization has made the mainstream elites more inclined toward a conservative stance that prioritizes stability and the economy, and toward a government-led, top-down, authority-and-order model of lame reform, as if economic reform consisting of power marketization and crony privatization with Chinese characteristics can automatically give birth to a free society. Without the active and broad participation of the elites, it is nearly impossible to launch a bottom-up civil movement for political reform. I do not wish to replay old tunes of how the CPC is too formidable or of China’s economic success or of the low quality of the Chinese people. Rather, I will attempt to examine the civil opposition movement itself, in particular, the conduct of the elite of the opposition movement including myself. I also sincerely hope to hear voices from different standpoints. HRIC published English translations of the articles cited as evidence against Liu, along with several of his court documents in “Freedom of Expression on Trial,” China Rights Forum, 2010, no. 1. These include “I Have No Enemies: My Final Statement,” which was read at the 2010 Nobel Peace Prize ceremony.